LISterine Workshops: LIS Technology, Endeavors, and Resources in Need of Explanation: Cool and refreshing! Cleans and protects against boredom and stagnation! This workshop series gives LIS a firsthand look at trends, tools and techniques that influence our work. Read more about these workshops. Want to present a workshop? Want someone else to present? Vote for it in the LISterine Feedback Forum! This entry was posted in LIS Staff Interest and tagged Areas and Workgroups, capture, LISterine, vid, video, workshops on November 10, 2009 by Carrie Macfarlane. The Curricular Technology team is working on the figuring out how to document technology, no small task… We are all in agreement that it would be good to have some sort of “quick start” documentation that provides people with the basics to get started with a given tool or a given task/objective. Below is a screencast of a “quick start” demo I did for how to capture. See: Capture > Presentation > How to do it. Alas these screencasts are a lot of work and am not sure how effective they are or how they can be improved… Though I think generally they should be as short as possible. This entry was posted in LIS Staff Interest and tagged Areas and Workgroups, capture, Curricular Technology, documentation, WordPress on November 6, 2009 by Alex Chapin. What technologies are available for web-based capture. By this I mean tools for recording audio and/or video from a web browser. Ideally, such tools would be widgets that can be embedded in any web page or any content management systems via a plugin or module. It used to be that Horizon Wimba was only reliable way to do this and even this solution was fraught with bugs. More recently the Adobe Flash Media Server (for which we have a license) and its open source counterpart Red5 have the capability to handle media streams from a browser. 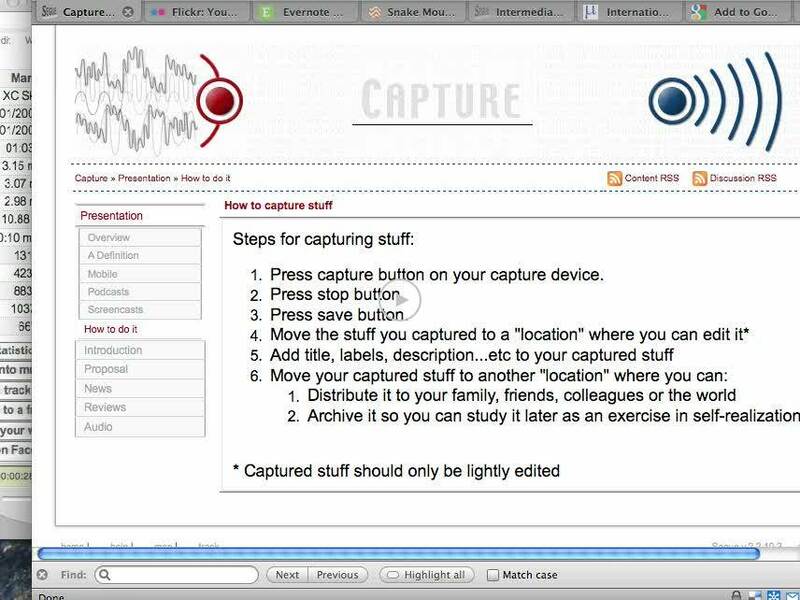 Pioneering work with these flash technologies for capture include Michegan State University’s ViewPoint and UOC’s LANGblog plugins for WordPress. This entry was posted in LIS Staff Interest and tagged capture, Curricular Technology, research, Teams on July 17, 2009 by Alex Chapin.